Hand signals can be used to train a dog and it's just as easy to do as verbal commands. Essentially, it's sign language; you'll use your hands to signal to your dog what you want it to do, such as sit or lie down. Dogs are excellent at reading body language. Many even find it much easier to read what people are saying with their bodies than with spoken language. Hand signals are useful in a variety of situations. For instance, they're often easier to use or required for competitive obedience or dog sports. Deaf dogs obviously won't be able to respond to spoken commands, so hand signals allow their owners to train them just like any other dog. And, if you enjoy training, this is one more thing to add to your dog's repertoire of skills. Just think how impressed your friends will be when you have your dog doing all sorts of tricks with just a few small movements of your hand. Hand signals are used instead of verbal commands and the first step is to get your dog's attention. Your dog must be able to see the hand signal, so make sure it's looking at you. It's best to introduce this training in a distraction-free environment. Go to an empty room of the house or outside during a time when you know distractions will be at a minimum. The quieter it is, the better because you want your dog's undivided attention. To get their attention, say your dog's name, snap your fingers, use a clicker, or make some other sort of sound. As soon as your dog looks up at you, proceed with the hand signal training. Many people find it easier to teach their dogs basic obedience commands by using hand signals before spoken commands. If you've already worked on verbal training, try to avoid saying the command while working with hand signals. From the owner's standpoint, that can be the most difficult part of this training. There are some standard hand signals recognized by most dog trainers which you might like to begin with. However, you can also create your own signals to train a dog. Once you have your dog's attention, immediately give the hand signal. For example, if you're telling your dog "sit," hold your hand palm out next to your body, and then bring the hand up until it's parallel to the floor. To get your dog to understand your visual queue, follow the usual training steps for the command you're working on. For example, if you're training the dog to sit, use the opposite hand (the one not used to give the hand signal) to hold a treat over its head to lure the dog into a sitting position. Reward good behavior and even successful attempts at following the command with treats. Be patient and consistent and keep training sessions limited to your dog's attention span. Older dogs will be able to train for longer periods of time than puppies. There are a couple of common mistakes people make when they train a dog with hand signals. Do your best to avoid these to make your training sessions more productive. Train hand signals separately from verbal commands. It can be confusing for a dog if you change between giving hand signals and verbal commands during the same training session. Stick to one or the other until your dog is able to do both with no hesitation. Sometimes dogs know verbal commands before they learn hand signals. If this is the case with your dog, be sure to give the hand signal first. You can then give the verbal command, and then practice several times until your dog learns to perform the command with just the hand signal. 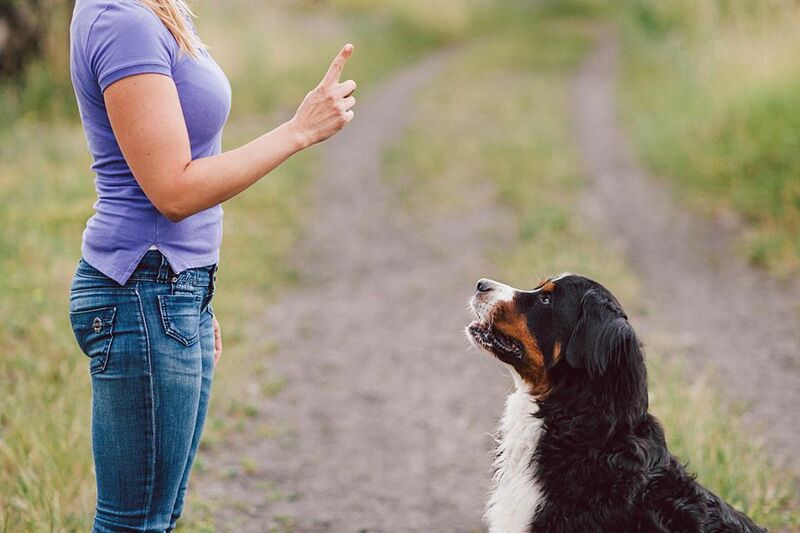 If you give the verbal command first, your dog will have a tougher time making the connection between the hand signal and what you want it to do. As with verbal commands, it's important that you keep up with hand signal training. Even if you switch between the two, be sure that there are times when you only use hand signals so your dog doesn't forget them. If your dog starts to disobey the visual commands, it's time to do more training sessions to reinforce the previous lessons. Go back to step one and work on each command just as you did in the beginning. It likely won't take as long for them to pick it up again.